TheRustedChain - The Blog: So flattered!! 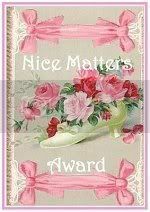 I just realized I received a Nice Mattters Award from Lissa at bullybeads. (Don't worry, she's not really a bully... Quite the opposite in fact!) :) So Thank you Lissa! I've also been featured on Indie Finds on Etsy! Thank you so much!! Email me with your address and I'll pop some earrings in the mail to you. Pooo! I missed...congrats to Marci!